I am 33 years old and currently enrolled in my employers traditional 401(k) plan where I am putting 4% of my salary pre tax and having a maximum of 4% employer match into my plan. After 6 more months of seniority I will be 100% vested and that employer match money will be mine to keep even if I leave. Apparently once I am vested, they offer Roth Conversions where I can move money from my Traditional 401k to my Roth 401k, and I can do this up to twice a year. When I do then of course I have to claim this money on my taxes that calendar year and pay taxes on it. When I am 59.5 years of age I can take money from this and not have to pay income taxes nor cap gains on earnings. My question is, what is the best choice here? Outside of my 401k I have a Traditional IRA with roughly the same amount, but I currently do not have a Roth. Should I ignore this new offering and continue to put 4% into my Traditional? Should I split my contributions and put 2% into Traditional and 2% into Roth? Should I stop putting into my Traditional and let my employer put 4% match into Traditional and then I put 4% post tax into Roth? Note: I contend that my question is similar to the tagged potential dupe though a different question. The potential dupe is from the context of someone newly entering the workforce, where my situation is of somebody with over 10 years into a career earning near the glass ceiling for my profession in my area of the country. The Roth/Traditional decision is complex, but can be broken down into a set of simple rules. Ideally, you want to choose to tax your money at the lowest possible rate. This specifically refers to your marginal rate, the rate you last $100 was taxed or next $100 of income with be taxed. That, in itself, is another issue, answered with questions here discussing marginal rates. My suggestion has been that if you are in the 15% bracket, use Roth. And continue to do so until you hit 25%. At that point, begin to shift to the traditional, pre-tax 401(k) or IRA. 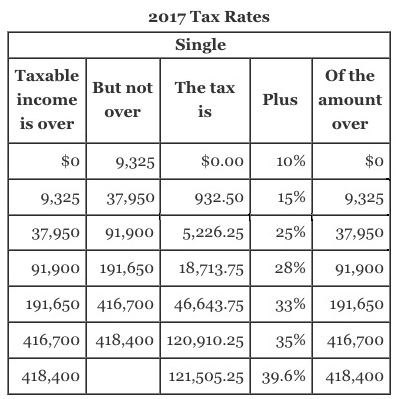 (My article The 15% solution, goes into detail on this, although it references the 2013 tax rates. I need to re-edit). If you are already in the 25% bracket, I'd suggest just going pre-tax. Given the ability to convert, it's not as if there are 2 points in time (deposit and withdrawal) but you can decide every year if your situation changes. It's not uncommon to get married, have a baby, buy a house, and find you just dropped back down to 15% marginal rate when you were solidly 25% prior. Let me explain why you should go 100% pretax if already at 25%. Say you are 'too' successful. You are hitting $2M before age 55. If you retire post-55, you can withdraw from the 401(k) penalty free. But, you have 15 years before you'd start to take SS benefits. 15 years to use conversions, even if pushing into 25%, to reduce the impact of SS taxation. My advice is not a set-and-forget solution. It's an annual evaluation of the plan for the coming year. I note that median individual income is ~$30K which puts that median single at ~20K taxable. This is where the analysis begins. This earner might have upward mobility, to reach the 25% bracket and begin to save pre-tax. The goal would be to have a mix of pre/post tax money, so that over the course of their life, the 25% bracket was avoided, perhaps completely. In general, my writing tend towards the second highest quintile, the 60-80% slice of the population. The numbers might appear arbitrary, but, in the end, the discussion has to start someplace. The concept I described here is best implemented by the single or couple who is still at 15%, but soon pushing higher than the 15/25 line. This enables them to start by saving in the Roth, and slowly shifting towards pre-tax. The final mix at retirement depends on that timing as well as their opportunities for conversions along the way. Part of my focus on that line is that the differential is greatest in bracket shifts between 15 and 25%. Much of the benefit in the whole IRA/401 discussion is in that shift, depositing at 25%, yet withdrawing at 15%. The 28% couple might wish to avoid the 33% bracket at retirement, but that level of income impacts far fewer people, and fewer still that are either reading these boards or my other writing. ...all employer contributions are pretax? It costs the employer less. Since Roth is after tax money, in order to contribute X into your Roth account, the employer would have to pay X+T where T is the amount of tax you pay, so that you are left with X. Employer's don't know what tax bracket you're in. This may seem counter-intuitive since they already withhold your tax, but the reality is that employers just guess based on the information you provide them (deductions, additional withholding, etc). They don't know if you have other sources of income which could raise your tax bracket, or if you have lots of deductions that could lower it. It would be impossible for an employer to figure out how much it would cost in order to give you a specified amount of money after tax. The only way an employer could logically contribute to your Roth directly would be by increasing your W2 wages by the same amount, but if they did that then you could just contribute to your own Roth with the extra money (up to the annual limit which is currently $18K). While the limits on paper for traditional and Roth are the same, in practice they are not--you can contribute more to a Roth than you can to a traditional. While the contribution limits are the "same" in both cases, the Roth holds after-tax dollars and an after-tax dollar is worth more than a pre-tax dollar. If you're not maxing your contribution this is completely irrelevant, but if you are maxing your contributions and would like to contribute more this is a big push in the Roth direction. Illustration: You're in the 25% bracket, you have $100k in a traditional IRA. What's it really worth? $75k--because the IRS will take $25k as you pull it out. You have the same $100k in a Roth, it's really worth $100k as the IRA won't take anything. Not the answer you're looking for? Browse other questions tagged united-states 401k roth-401k roth-conversion employer-match or ask your own question. If my 401k plan allows for pretax and Roth contributions, why would I want to open an IRA? Are employer 401k matching contributions invested prior to vesting?